We went for a picnic with friends out to Starrigavan. After eating, a group of us took a hike around Mosquito Cove trail. This evening after church, we went to McDonalds with friends. On the way home I stopped at Swan Lake to take a look, but I did not have my camera, so I was not able to take any photos. Weather: There was some low clouds and fog in the morning. They started clearing off through late morning, and there were some cloud breaks before it became overcast. The rain held off until later in the evening. Birds: At swan lake this evening I saw a Green-winged Teal and I am pretty sure there was also an American Wigeon. There were many Mallards with young in various stages of development. Flora: It has been awhile since I hiked Mosquito Cove. I had forgotten how lush some of the mosses are along the trail. 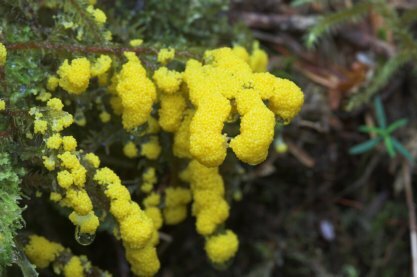 The big thing of the day was slime molds. I think there were at least four different kinds of slime molds that we saw along the trail. Some of them were visible at more than one location. Melissa was looking at the beach fringe at Mosquito Cove and noticed a Galium that did not seem to be cleavers or sweat scented bedstraw. After looking it up in the book when we got home, she concluded that it was probably little bedstraw. Other Notes: Bear droppings were plentiful along the trail. A sign posted along the trail indicated that bear had been seen on the trail most days over the last week or so. There were a couple of seiners making sets just off shore from the beach part of the Mosquito Cove trail loop. This entry was posted in bears, birds, daily, flora, photo. Bookmark the permalink.